I love this painting–the color combination is absolutely stunning. Thank you very much, Mike. I appreciate your supportive comment. I’m pleased with the colour combination too. 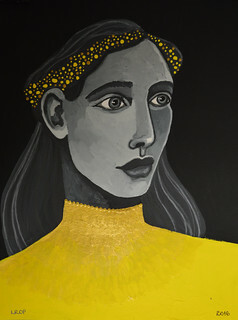 The yellow really pops against the grey and contributes some warmth to the piece. Striking pose Karen! I love everything about it. I love that you went out on a limb with the gray and yellow. It is brilliant! Thank you very much, Hannah! She’s awesome! Very Grecian…or Roman? Thank you very much, Deanna. I think it is probably the diadem that suggests something from the classical era. That wasn’t conscious but it may be the influence of my husband who is obsessed with all things ancient Rome. I am just better at dots than at flowers and that is why she ended up with that headdress. Love the gray and yellow! I think them being similar is a good thing as it shows your own unique style. Love her expression! Thanks! A number of people have said that so I guess I should just go with it and let that be my style certainly when it comes to faces rendered in acrylic which I’m not so adept at using. I do not think that you are stuck in a rut, Laura. Your own unique style is showing even if most of them have very strong features. Embrace those strong features, they are beautiful. Also, I think your decision with the gray and yellow color combo was great. She looks very regal in that combination. Thank you very much for your encouraging comment. I think when I embark on the project to draw 100 faces I will aim for more variety and hopefully that will translate into more variety in my paintings too. Thank you! I’m happy I chose yellow. I love the color contrast! Awsome!